The Rock of Cashel (Irish: Carraig Phádraig), also known as Cashel of the Kings and St. Patrick's Rock, is a historic site located at Cashel, County Tipperary, Ireland. The oldest and tallest of the buildings is the well preserved round tower (28 metres, or 90 feet), dating from c.1100. 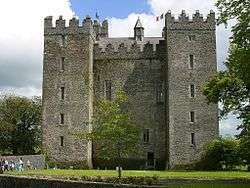 Its entrance is 12 feet (3.7 m) from the ground, necessitated by a shallow foundation (about 3 feet) typical of round towers. The tower was built using the dry stone method. Modern conservationists have filled in some of the tower with mortar for safety reasons. Cormac's Chapel, the chapel of King Cormac Mac Carthaigh, was begun in 1127 and consecrated in 1134. It is a very sophisticated structure, unlike most Irish Romanesque churches, which are ordinarily simple in plan with isolated decorated features. The Irish Abbot of Regensburg, Dirmicius of Regensburg, sent two of his carpenters to help in the work and the twin towers on either side of the junction of the nave and chancel are strongly suggestive of their Germanic influence, as this feature is otherwise unknown in Ireland. Other notable features of the building include interior and exterior arcading, a barrel-vaulted roof, a carved tympanum over both doorways, the magnificent north doorway and chancel arch. It contains one of the best-preserved Irish frescoes from this time period. The Chapel was constructed primarily of sandstone which has become waterlogged over the centuries, significantly damaging the interior frescos. Restoration and preservation required the chapel be completely enclosed in a rain-proof structure with interior dehumifiers to dry out the stone. The Cathedral, built between 1235 and 1270, is an aisleless building of cruciform plan, having a central tower and terminating westwards in a massive residential castle. The Hall of the Vicars Choral was built in the 15th century. The vicars choral were laymen (sometimes minor canons) appointed to assist in chanting the cathedral services. At Cashel there were originally eight vicars choral with their own seal. This was later reduced to five honorary vicars choral who appointed singing-men as their deputies, a practice which continued until 1836. The restoration of the Hall was undertaken by the Office of Public Works as a project in connection with the European Architectural Heritage Year, 1975. Through it visitors now enter the site. 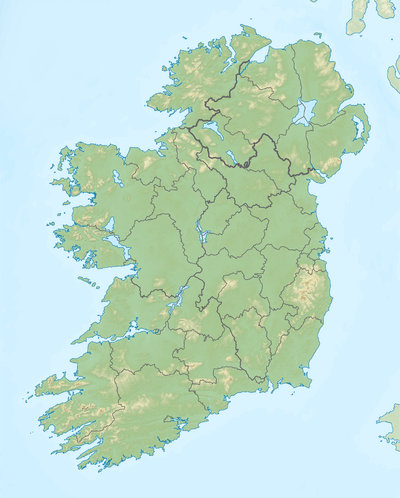 In 1647, during the Irish Confederate Wars, Cashel was sacked by English Parliamentarian troops under Murrough O'Brien, 1st Earl of Inchiquin. The Irish Confederate troops there were massacred, as were the Roman Catholic clergy, including Theobald Stapleton. Inchiquin's troops looted or destroyed many important religious artefacts. In 1749 the main cathedral roof was removed by Arthur Price, the Anglican Archbishop of Cashel. 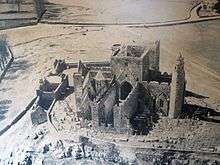 Today, what remains of the Rock of Cashel has become a tourist attraction. Price's decision to remove the roof on what had been the jewel among Irish church buildings was criticised before and since. Queen Elizabeth II visited the Rock of Cashel during her 2011 visit to Ireland. The entire plateau on which the buildings and graveyard lie is walled. In the grounds around the buildings an extensive graveyard includes a number of high crosses. Scully's Cross, one of the largest and most famous high crosses here, originally constructed in 1867 to commemorate the Scully family, was destroyed in 1976 when lightning struck a metal rod that ran the length of the cross. The remains of the top of the cross now lie at the base of the cross adjacent to the rock wall. 1 2 3 Seymour, John (1907). Records of the past. 6. Records of the Past Exploration Society. pp. 259–263. 1 2 3 Howitt, William (1864). Ruined abbeys and castles of Great Britain. 2. A.W. Bennett. pp. 159–161. Wikimedia Commons has media related to Rock of Cashel.